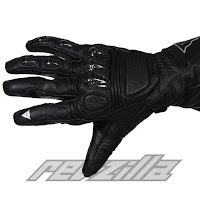 At a reasonable price point of $159, the Dainese Hellfire EVO Glove is a remarkable contribution for the rider focused on sport riding and sport touring. Constructed from top-grain Italian leather and offering the protection of a full gauntlet, the Hellfire is an entry-level glove from Dainese but really falls into the mid-range of sport touring gloves in terms of how it stacks up to other manufacturers. First thing's first: style. Dainese's leather motorcycle gear excels in this department with its classic Italian design. The leather is soft and the attention to detail is extraordinary. We all know The Doctor is wearing this brand. I think that's about the biggest endorsement you can get: the guy with 9 MotoGP championships swears by your brand. Protection on this glove is paramount for a sport touring glove. You have injected temperfoam panels in the back of the hand and on the first knuckle. Thermoplastic Resin inserts protect the last three knuckles as well as the finger knuckles on the ring & little fingers. The pinky is wrapped and reinforced for protection in the event of a get-off. It's a helpful assist in the prevention of a bone dislocation or even break. Reinforced leather and padding lives in the first two fingers as well in the heel of the hand. An elasticated wrist panel and a velcro adjustment strap ensures tight, proper fitting and maintains proper placement of hard parts. The single cuff velcro wrist closure is large enough to allow the jacket to be worn inside or outside of a jacket, depending on your style. 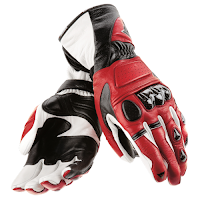 The neoprene lining on the cuff provides a soft feel to the skin and features the Dainese logo. 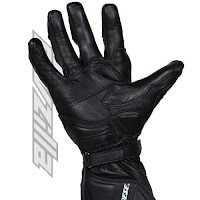 The smartly placed stitched Dainese logos round out this excellent sport touring motorcycle glove. To compare this glove to its competitors, visit our motorcycle gloves section at RevZilla.com. 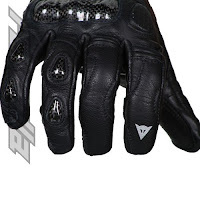 Also, don't miss the Dainese Womens Hellfire EVO Glove.